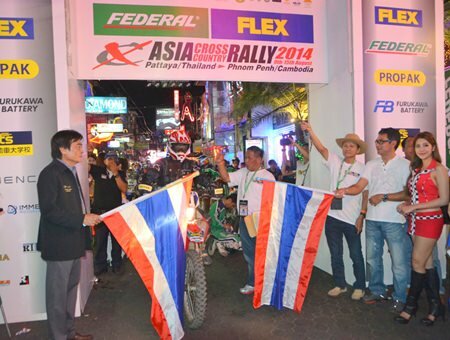 The 2014 Asian Cross Country Rally left from Walking Street August 9 for six days in the jungle, with the finish being in Phnom Penh, Cambodia. There are 31 cars entered and 20 motorcycles. 11 of the cars are Thai entrants, with the rest Japanese, and the motorcycles have entrants from Sweden, Korea, Cambodia and Japan. The rally has been an annual event since 1996. 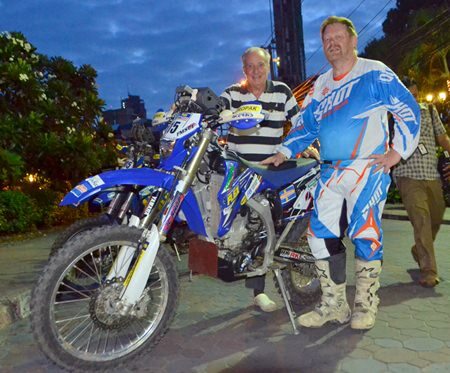 (L to R) Touch Thach from the Cambodia Motor Sport Federation (CMSF); Jakkrit Chaothale riding for Team Thailand; Freddy Karlson from Sweden; Chea Lykheang from CMSF and Koun Phandara from CMSF prepare to set out from Walking Street. Vehicles parade down Walking Street before setting off for the jungle. Deputy Mayor Ronakit Ekasingh (left) waves the starting flag for the rally participants. Dr. Iain Corness wishes Freddy Karlson good luck.